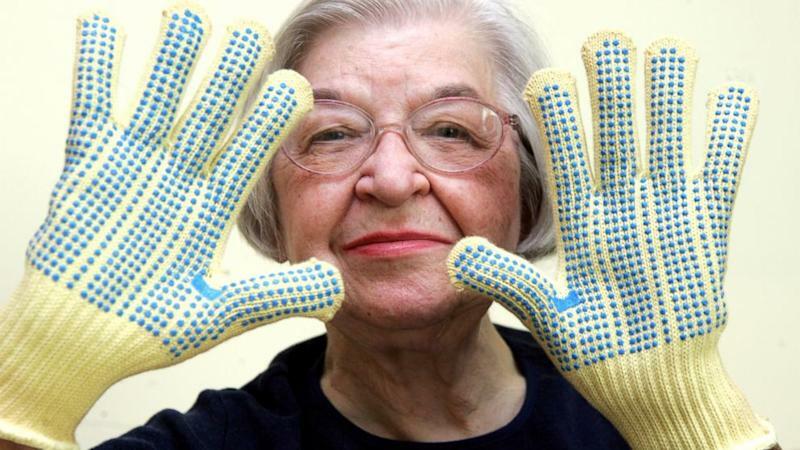 As one of the few pioneering female chemists in the 1960s, Stephanie Kwolek invented the flexible, tougher than steel fibers that were used to create life-saving body armor for law enforcement and soldiers. Kwolek died this week at the age of 90, her co-workers at DuPont, the chemical company where Kwolek worked, confirmed to ABC News. "She leaves a wonderful legacy of thousands of lives saved and countless injuries prevented by products made possible by her discovery," DuPont CEO Ellen Kullman said in a statement. In 1965, Kwolek devised a liquid crystal solution that could be cold-spun. Nearly half a century later, her discovery and legacy have endured through a variety of goods ranging from bulletproof vests to sports rackets and smartphones. Earlier this week, the one millionth vest using the latest Kevlar technology was sold, according to DuPont, showing just how important Kwolek's discovery remains, even half a century after she did what researchers had long struggled to do. Kevlar has been used to make sporting goods "lighter, stronger and safer," according to DuPont. It can be found in motorcycle components and clothing, as well as skis, racquets, canoes and kayaks. Kevlar's resistance to chemicals and extreme temperatures makes it ideal for personal electronics, according to DuPont's website. Goodyear has used the material to create a tire with Kevlar reinforced sidewalls that DuPont said can increase puncture resistance by 35 percent. Kwolek, who aspired to be a fashion designer before she discovered a love of chemistry, served as a mentor for other female scientists throughout her career. She also participated in programs aimed to introduce children to science. Kullman remembered her as a "creative and determined chemist and a true pioneer for women in science." A Catholic Mass to celebrate Kwolek's life is scheduled for June 28, according to the Associated Press.